Coupon lovers are really starting to catch onto this no scissors approach to coupon shopping. It's easy, no paper cuts and no running around looking for coupons. This first step is to add My County Market's app to your phone and home computer. You can use either or both. Whichever is convenient for you. The offers are the same. Once you have the My County Market App rolling, add Ibotta to your shopping clicks. It's a nationwide rebate program when you can clip even more offers that you paid on Paypal. It also works with your max card so no hassles for you. Just see their offers, click and get money. This past weekend I was looking for deals on my phone and found the best deals on My County Market App. We were headed out of town for 4 days camping. We managed to save 40% on our entire shopping cart with a combination of offers. Do you want to see? My coupon Countdown with phone app. 1. Download the My County Market App onto your phone. 2. It will ask you to confirm your email and Max card. You can just snap a pic of your max card when it asks you for it. Be sure these are correct! It's how they ties to your max card shopping. 3. Click some offers and have them in your virtual wallet. 4. Shop at the store and pick up the items in your virtual shopping list. 5. Get money! As you buy things, then scan your max card it automatically will post to your account. Next time you shop, you'll have $dollars off your order to redeem from your phone. It's really easy to do. 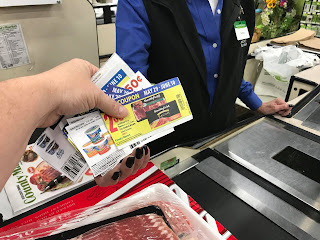 I love the fact that I can pick up name brand coupons that are not available on coupons.com or smartsource, like Pepsi, Frito Lay, Campbells, and County Market store brand staples. I picked up $10 just for signing up with Ibotta on my phone. Boom! Direct to my paypal account. Then I picked up some Pillsbury offers, $.50 on any bread, $.25 on any bananas, and $1 on milk, for extra this week. These are in addition to your weekly totals, and YES you can still add printed or newspaper coupons to your order. How cool is that? I want to hear back from you this week. Use your apps and share on Facebook how much you have saved. Good Luck!